A few dry things about myself: My name is Anca. I was born and raised in Romania, and lived in the United States since 2001. I was educated towards a corporate career path; but I came to the conclusion that I’m too independent for that, and always preferred my own business. I like simplicity and peace of mind, I’m not in favor of drama and entanglements of life. I like to maintain inner harmony through meditation and an introspective mind. I find myself now at the end of a few major commitments. Before I make new ones, I will do what I’ve always wanted to do: travel with no end in mind, travel anywhere, travel free. I have a curiosity for South-East Asia, mostly Thailand. I’ll leave shortly via Dubai, and will be in the area for a while. I have traveled a lot before, but this time will be more about reflexion, immersion, introspection, and who I am in relation to what I see. I am no longer motivated to see many things. It may sound superficial, but I find that after seeing hundreds of temples, or mountains, or waterfalls, all of them will look the same give or take. What matters is my own experience in relation to what I see, more than the object of seeing. In other words, the becoming in seeing things with different eyes. I have always wanted to go somewhere, to explore something, and to never return. 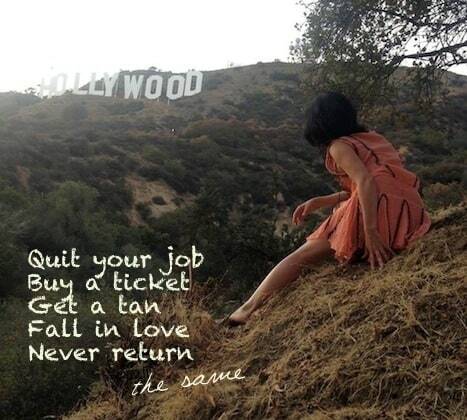 Or in other words, never return the same. In life, there’s no running away from, and no arrival to. It all goes around in circles around our own self. And here’s my motif and philosophy of Moving in Circles. My intention is to move freely, to go where the energy takes me, or to go where the path leads me to. That’s why it’s a one way ticket. Although I will come back to same place, it will be rather a continuity than a return. Because in reality we never return, but we keep going although to the same places sometimes. And again the motif of Moving in Circles. I am laying down this blog as a painter lays his canvas. In case I get inspiration to write. Sometimes, I feel very inspired. But if something becomes an obligation, my creative juices stop. Just like the alarm clock – I may be on the verge to wake up, the alarm sounds, and I suddenly feel the urge to sleep some more. So I will have no alarm; there will be nobody to wake me up. If I want to write, I’ll have it all laid down. If not, it will stay as it is. So dear friend, do not expect anything of me. But I’ll be back most likely :).